George Friederich Handel (1685-1759) was the composer of "Hornpipe," one of the pieces from his Water Music suite. Although Handel was born in Germany, he spent most of his adult life as a musician in England. He showed an early interest in music, but his father, a barber-surgeon, wanted him to be a lawyer. 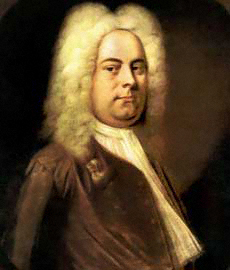 Handel's musical talent was so apparent that his father finally gave his reluctant approval for him to study music. Following Handel's graduation from the University of Halle, he became a church organist for a brief period, and then moved to Hamburg where he composed his first opera in 1705. In 1706, Handel moved to Italy for several years to further his interest in Italian music, and while there, he received acclaim as a promising young composer. 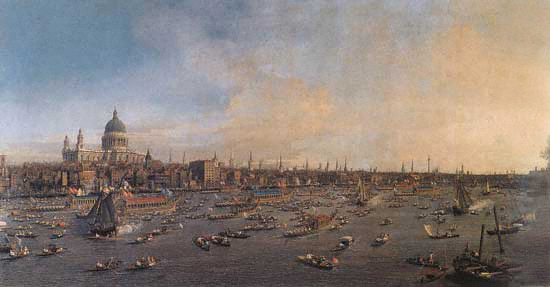 Handel wrote his orchestral suite, Water Music, in 1717 to provide musical entertainment for King George I and his guests as they traveled along the Thames River in a royal barge procession (the orchestra of 50 musicians was on its own barge). The musical definition of a suite is a collection of pieces, put together in an ordered manner. During the Baroque era, pieces in a suite were often dance forms such as: prelude, allemande, courante, saraband, gigue, bourre, gavotte, and minuet. After the Baroque era, suites often were pieces extracted from a larger work such as The Nutcracker Suite, a compilation of pieces taken from the ballet The Nutcracker. TECHNIQUE TIPS: This piece, "Hornpipe" from Handel's Water Music, has the 3/2 meter and musical form of the country dance version of the hornpipe. Handel indicated that this movement should be played allegro (a quick, lively and fast tempo), and that it should begin with the dynamic level of f (meaning forte, play loudly with a strong sound). Be sure to contrast the dynamics of the beginning section (measures 1-11), with the mp section beginning in measure 12 (mp means mezzo piano, moderately soft). The main theme and forte section return in measure 28 to the end.